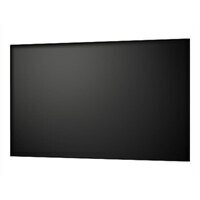 Da-Lite Parallax Thin HDTV Format - projection screen - 110 in (109.8 in)Parallax Thin ships already assembled with a thin-bezeled frame. The ambient light-rejecting technology features a micro-layered optical lens system that rejects light. This new technology mimics the look of a television when it is on and when it is off, but without the glare from windows or lighting fixtures. With extremely wide viewing angles, no speckle and no glare, the surface is ideal for applications in Pro AV as well as Home Theater. Each layer of Parallax plays a role in preserving the image that is reflected back to the viewer in high ambient light environments. Some layers absorb light while one special layer is shaped like a microscopic saw-tooth that blocks light from above resulting in the preservation of high-contrast, bright images in brightly lit environments. Parallax Thin ships already assembled with a thin-bezeled frame. The ambient light-rejecting technology features a micro-layered optical lens system that rejects light. This new technology mimics the look of a television when it is on and when it is off, but without the glare from windows or lighting fixtures. With extremely wide viewing angles, no speckle and no glare, the surface is ideal for applications in Pro AV as well as Home Theater. Each layer of Parallax plays a role in preserving the image that is reflected back to the viewer in high ambient light environments. Some layers absorb light while one special layer is shaped like a microscopic saw-tooth that blocks light from above resulting in the preservation of high-contrast, bright images in brightly lit environments.